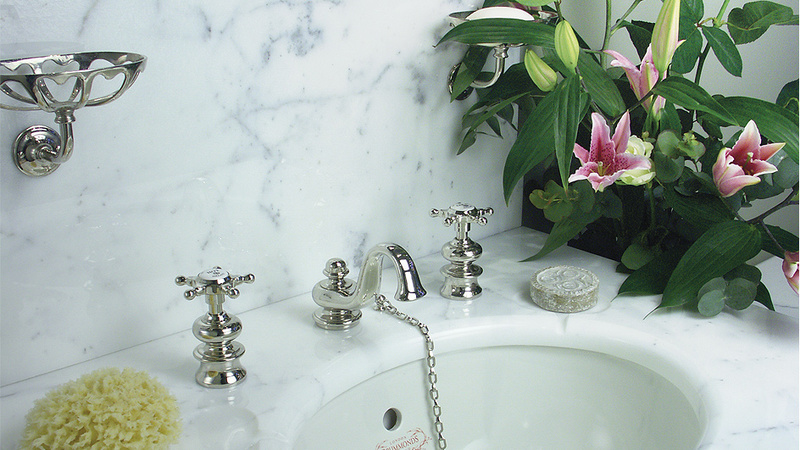 When it comes to marble, Carrara is definitely my favorite choice. 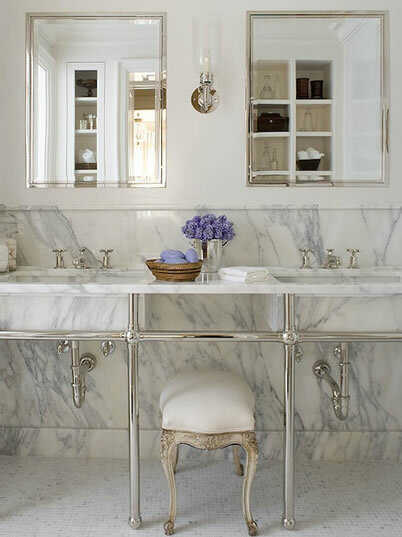 Whether it is for the bathroom or kitchen, I love the simple and clean aesthetic look that white marble lends. Contractors have been discouraging homeowners from using Carrara forever because it stains and scratches easily and generally is not a good application. My answer? So...? Have they ever been to Italy? Have they seen marble stairs there that are hundreds of years old? Have they been to our local Il Fornaio restaurant with a marble counter at the bar? Scratches and stains add to the patina! I say, "throw caution to the wind," and go for it! 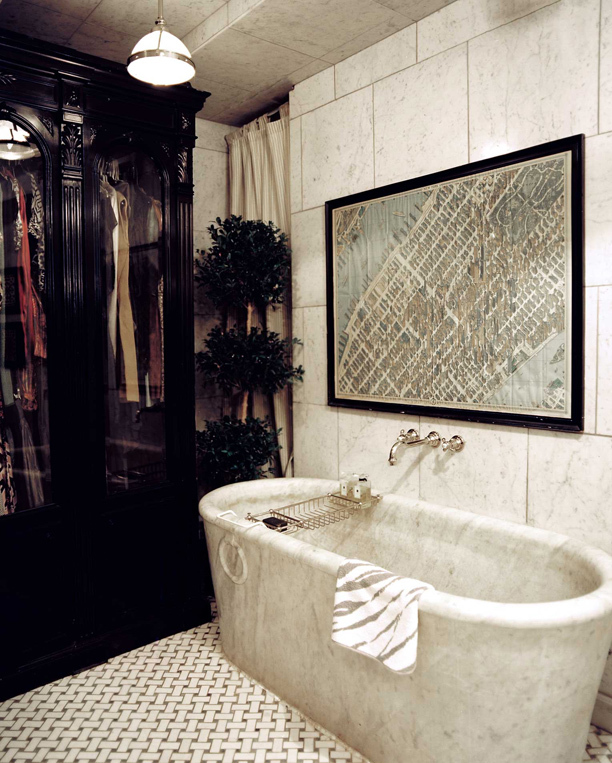 The ultimate luxury: a marble soaking tub! No need for a shower curtain here! And finally, a kitchen counter that is absolutely amazing! I am loving all the grey veining in this slab. Carrara marble comes from Carrara, Italy, a town in Tuscany that I have passed by twice while on our way to Cinque Terra. I wish we would have stopped to see this town that is rich in history with the marble mountains looming above. 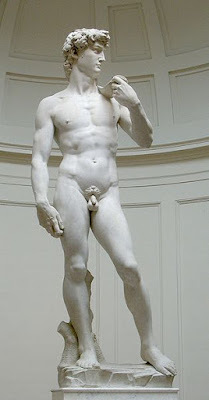 This is where the chunk of marble came from that became Michaelangelo's David. And this is where the chunk of marble will come from that will become my bathroom counter when the time comes. Beautiful! I had marble kitchen counters in the Middle east when we lived there. Both countries. Its an amazing surface for rolling out cookies and I too love the white and grey color. 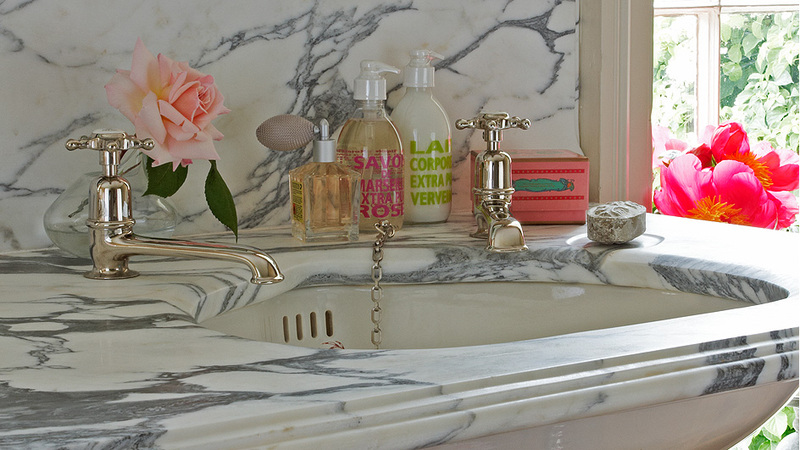 There is no more beautiful counter material than marble. It's not for everyone, and I think it is a better choice for a bathroom than a kitchen --- at least a working kitchen. Although my ideal kitchen would have a marble topped baking area! Love, love ,love it! I dont have any marble and wish I did. Next house I guess.. I agree, and good for you that you are going to have it in your bathroom. I'd like to have that soaking tub! Another great post full of inspiration and information. I would love to have marble kitchen counters; unfortunately I am limited to an xl marble pastry board that doubles as a huge cheese platter. I agree; can't go wrong with Carrara! Beautiful inspiration photos, love the marble it is gorgeous! 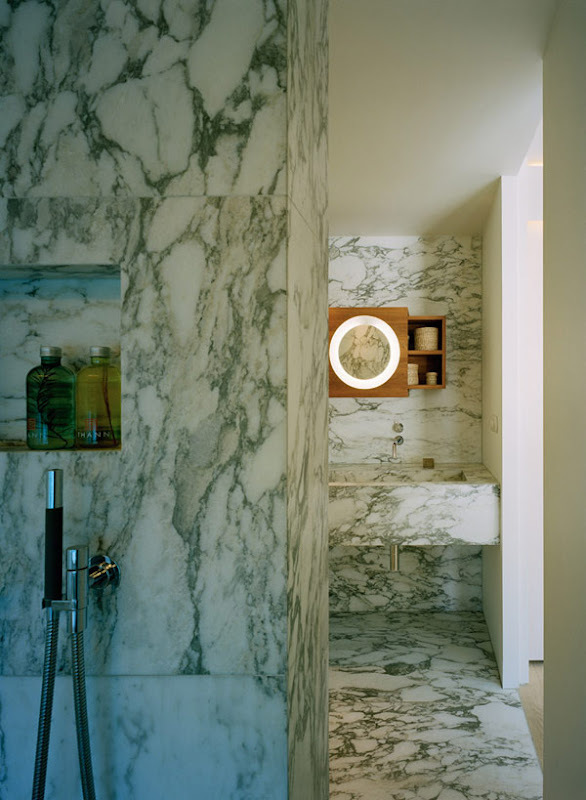 I am in total marble heaven seeing all these amazing pictures. I think one or two towards the bottom might be calcutta gold (off the same block as carerra but from a different end and with a slight goldish vein running through them) these are exquisite. I am like you, marble is EVERYWHERE in Europe! Pizzerias, steps, hotel foyers, every countertop in every restaurant. 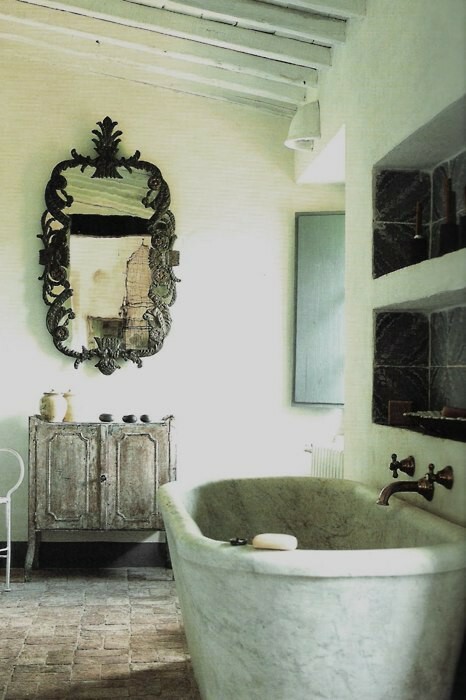 I love an aged patina in any case that you get from use, its give it such an authentic feel. The 2nd and 3rd pictures are GORGEOUS but then again they all are! 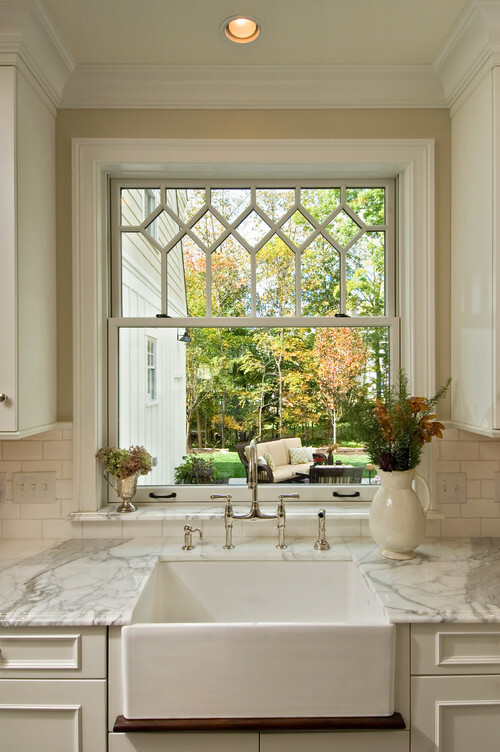 I am totally into Carrara marble- we have in the kitchen in the country and its a work house surface. It is also great for rolling pastry. By the way as it gets spotted, it begins to tell the story of life in the kitchen. I love it too. Someday I hope to have it in my home somewhere. I love it too and have a bit of it in the upstairs section of my house. Stunning! Love this material so much! 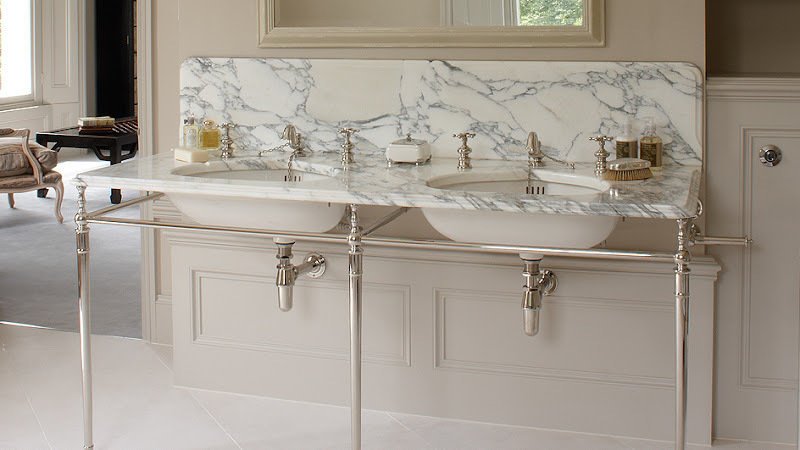 We absolutely love carerra marble and have used it in both of our houses. Beautiful collection of photos to inspire! 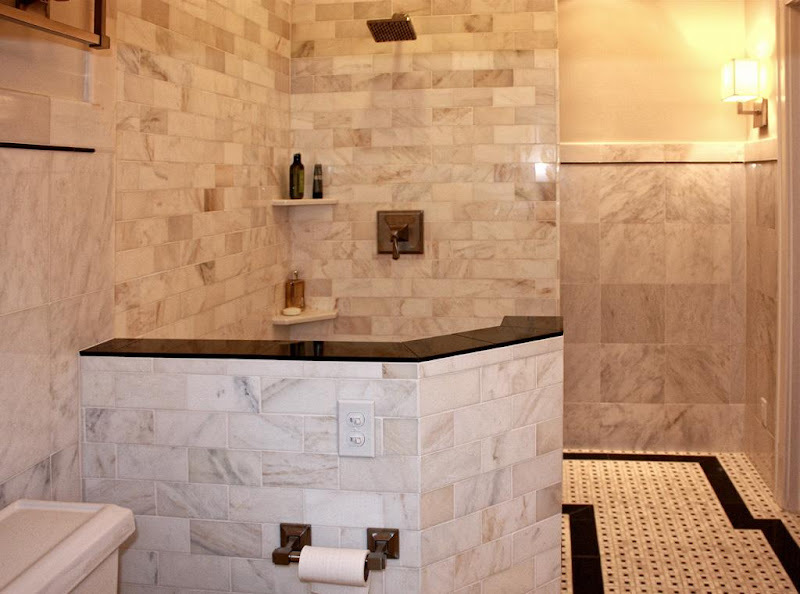 Wish we had the bank account to afford the marble soaker tub! These photos are amazing. I love the look of the marble in every photo. Marble wouldn't fit the style in our craftsman bungalow but it is fun to dream. I was camping in France and they even had marble in the area where you could clean your dishes. This just couldn't be more timely. I'm in the process of rennovating our guest bath using cararra on the floor and as a detail in the subway tile surround on the shower wall. Love these inspiring photos and P.S. thanks for correcting the spelling. I saw some cararra at Home Depot and they had spelled it correctly, but to my mind it was wrong since I thought the word had an "e" in it. 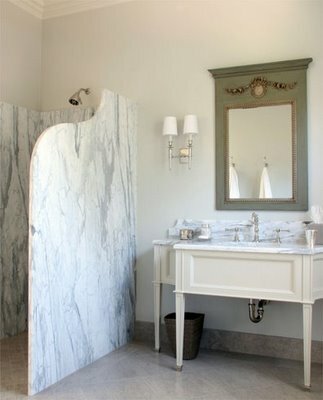 I love carrara marble too! I think it's so attractive in a kitchen! Seeing it in bathrooms also looks great! I always heard marble is good for kneading bread and making pie dough on, but I also heard it stains with the oils/fats. I saw a kitchen where they had a lowered cabinet with the marble on it just for just that kind of job task and I always wanted one since! I also love seeing it on an island! I am redoing my kitchen and just chose my slabs, Calcutta Gold Macchia Vecchia. They are a beautiful gray and white with an occasional vein of ochre. I am having them honed and sealed and then letting whatever happens happen. It was very difficult to find the right slabs here in SW Florida, because many, including the suppliers, are concerned about stains. If you want your house to have some character, folks, it cannot be showroom perfect. Thanks for the pictures, Delores. What beautiful examples. Wow! Your photos are beautiful! Every time I'm in a project and slab-hunting, the carrara is pretty grey-muddy. I usually wind up going to another white marble, like Calacutta or statuary marble. has a nice display of different marbles if other people are running into the same problems. I just used venato from buildersdepotdirect.com and got subway for $7/ft. It was such a great buy, I had to share it!